Before you upgrade to v8 did you get your shield to pass traffic by copying over the network config? network.br is supposed to be there. It's just the default settings if you ever need them. You can see it in system > startup where it copies that file over to /etc/config/network . Hi, Roadrunnere42 should I change the 2 file names back to dnsmasq and fw_upgrade? and then upload them ? @Roadrunnere42 thanks and nice work as usual!!! yes rename both the files. For some reason your /etc/config/dhcp had the pre hotfix settings. Please make the changes in those two files and report back. Thanks user8446 can you tell me the steps on how to make the make the changes? would updating to V 8.0 fix etc/config/dhcp ? 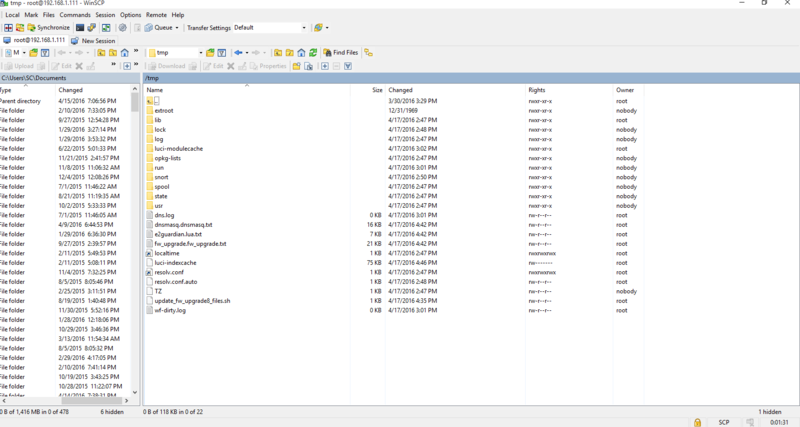 With WinSCP you can just copy/paste the changes into the file and then save. If I do a factory reset would that clear out all My Lan DHCP files in the Shield? And if i then update to version 8 would all the hot fixs be applied? or would I have to reinstall the march 7 Hotfix? Hi, user8446 I see hotfix_160309-FINAL on my Root folder is there newer hotfix out?